A former Head of Service of the Federation (HOS), Mr. Steve Oronsaye, was on Friday charged before a Federal High Court sitting in Abuja over his alleged involvement in N1.2 billion graft while he held sway as head of the civil service. In the charge filed before the court, Oronsaye, alongside two other persons, Osarenkhoe Afe and Frederick Hamilton, as well as Global Services Limited, allegedly siphoned at least N1.2 billion from the federal treasury during his tenure as head of the civil service. The Economic and Financial Crimes Commission (EFCC), which filed 24-count charges bordering on money laundering and corruption against them, also alleged that one of the accomplices in the alleged crime, Abdulrasheed Abdullahi Maina, who is now at large, all connived to commit procurement fraud in the biometric enrolment job purportedly awarded to Innovative Solutions Limited without following due process. The case has been assigned to Justice Gabriel Kolawole of the Federal High Court, Abuja. Oronsaye, who was arrested by the anti-graft agency on Wednesday on allegations of corruption, ran into fresh trouble when new allegations emerged that he was engaged in theft and money laundering. The commission had granted him administrative bail and ordered him to report for further interrogation Friday. After hours of rigorous questioning by top officials of the commission, the 24-count charges were drawn up against him. It was gathered that Oronsaye and other top directors of the civil service allegedly colluded to defraud the nation of N6.2 billion pension fund through a maze of bogus contracts meant for biometric enrolment and payment for computer accessories that were never supplied. 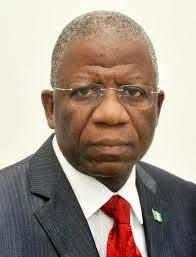 Oronsaye, 64, was appointed the Head of the Nigerian Civil Service in 2009. The accused persons, who are still being held at an EFCC detention facility in Abuja, will be arraigned in court by the anti-graft agency on Monday.